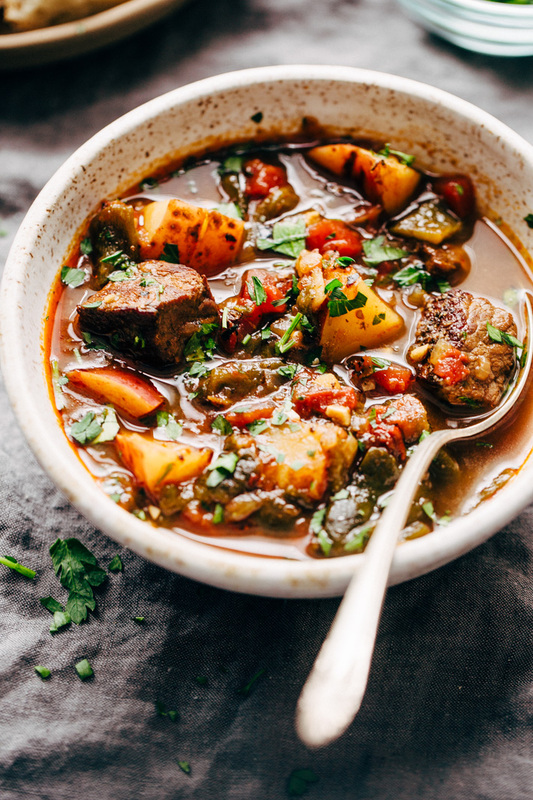 The heartiest bowl of poblano beef stew! 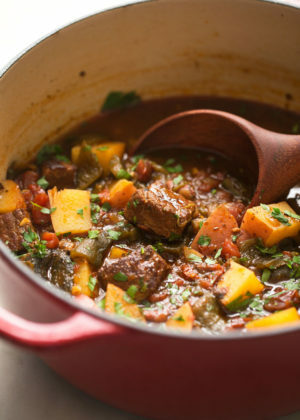 This stew is simple but loaded with oh so much goodness. It’s warm, it’s cozy, it’s perfect for chili evenings! Big, hearty bowls of poblano beef stew need just one thing to make them extra perfect. I can’t get it off my mind! Especially when crusty bread is involved. Nothing too fancy here, kids! 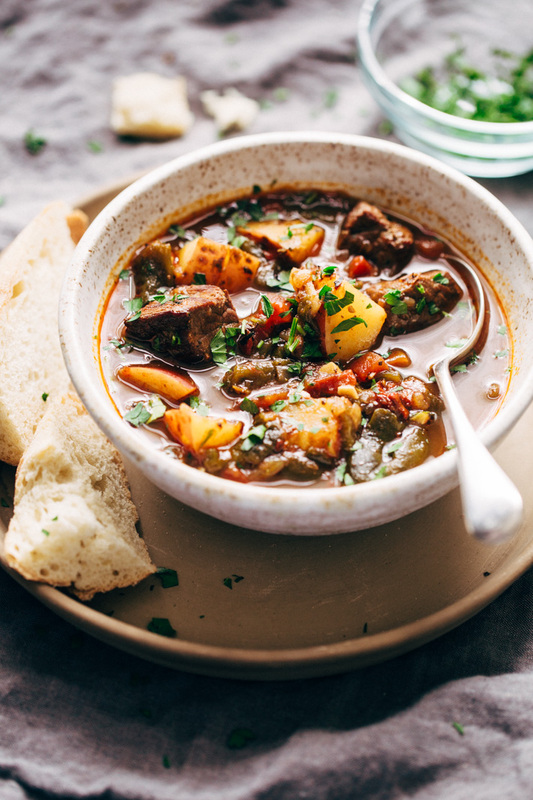 Just a warm and comforting bowl of the smokiest poblano and chipotle pepper beef stew that’ll give your regular old beef stew a run for it’s money. Just a little facelift and you know, get the family excited again about basic food again. ?????? What I want you to know is that this beef stew is loaded with the same goodness we like from a good stew recipe. It’s got the potatoes, check. And the tender chunks of beef, check. Also, the flavorful hearty broth, check. 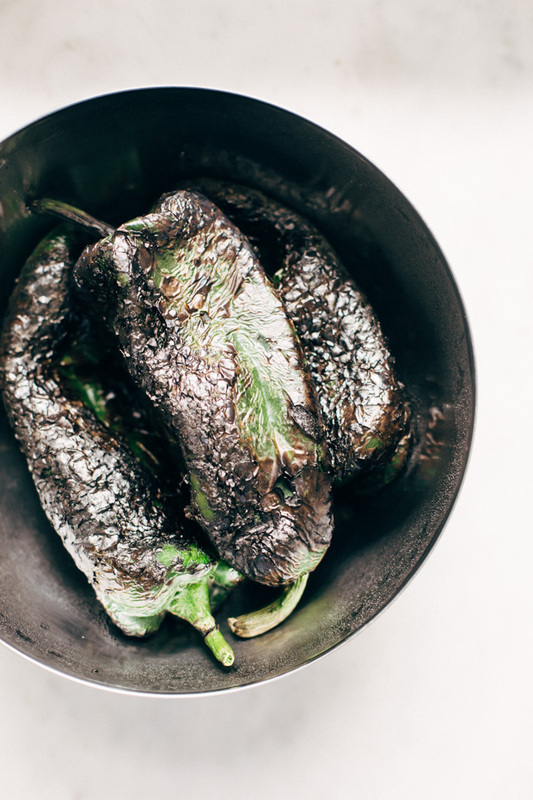 But what it also has is these deliciously smoky poblano peppers that add the heartiest depth of flavor. Also, cooking something for a couple of hours and making it taste like it’s been slow simmered all day. Cheater meals are my favorite! This all starts with a 3 huge poblano peppers. It is a POBLANO beef stew, after all. We’ll need them in fresh form and start by giving them a good roasting. You can do this on the stove or in the oven. Either way works. I usually use a pair of tongs and just let them roast for about 5 minutes on the stove. If you don’t have a gas stove though, this can be a little tricky. The other option is broiling the poblano peppers in the oven. It’ll take about the same time and the flavor is the same either way. But it’s important not to skip this step because here we get a chance to add in that good old smokey flavor. Also, that skin needs to go! So we’ll char the peppers and then cover them and let them steam so the skin peels right off. Once that’s done we’ll start on the stew. 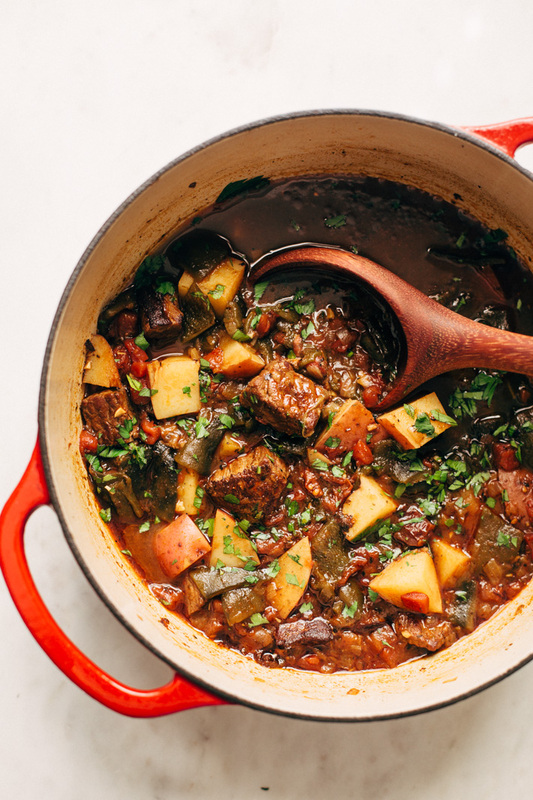 Like any good stew recipe, you want to start this poblano beef stew by searing the meat. This allows the meat to really hold in all the juices and be tender when you bite into it. And this really is the difference between a meh stew, and a ? stew. You can use any type of ‘stewing meat’ for this recipe, I just usually use a beef chuck roast. A top round or a bottom round will also work. Remember, the size of the meat is also important. I used 1-inch cubes, which cooked up nice and tender in about 1-1 ½ hours. If your meat is cut into larger pieces, it’ll take a little longer to get tender. Once you brown the meat, you want to use the same pot to sauté the onions and garlic. Please! Oh, please, whatever you do, don’t switch to a new pot! All that brown char that develops when you brown the beef is gold in this recipe. When you sweat the onions, it’ll start loosening up and coating them. Once you’ve got the onions and garlic sautéed off, this becomes a pretty straightforward beef stew recipe. I added in a chopped chipotle pepper with a couple tablespoons of adobo sauce along with the beef broth, a can of fire-roasted tomatoes, and some smoky cumin. The chipotle peppers just build more smokiness and might I add that the potatoes are totally more delicious when stewed in chipotle pepper speckled stew? This is optional though as the chipotle peppers do pack on a quite a bit of heat. If spicer food isn’t your thing, you can leave out the adobo sauce or use a little adobo and leave out the chipotle pepper. And if you prefer super spicy food, feel free to add in more chipotle peppers to your liking! I usually serve up poblano beef stew with lots of toasty, crusty bread. This time around the hubby requested garlic bread with the stew! Not that the stew needed additional garlic or anything. Just the way we do things round here. I used a little olive oil, and toasted the bread. When it was hot outta the oven, I gave it a good rub with a whole garlic clove, sprinkled on a little salt, and freshly chopped parsley. SO GOOD. 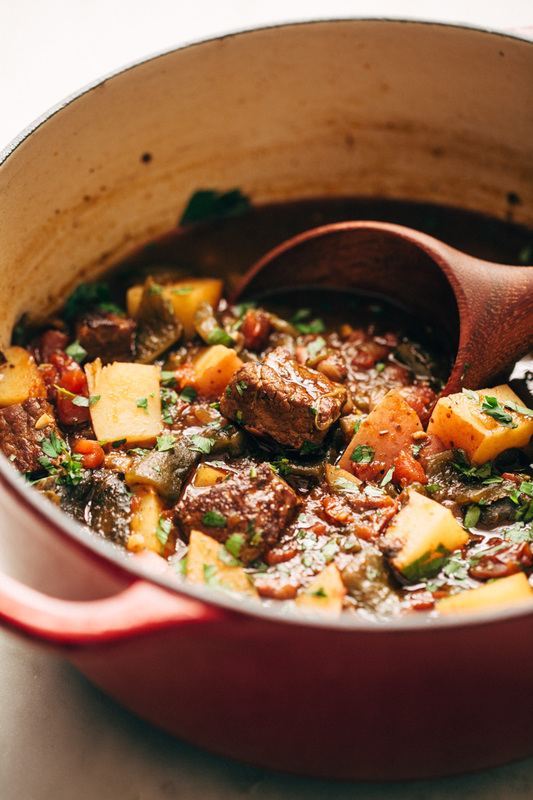 This is totally doable, even if you’ve never made beef stew before. Did I mention it’s the perfect weeknight or weekend dinner that’s totally satisfying and will keep you all warm and cozy? POBLANOS: Char the poblano peppers over an open flame for about 5 minutes, turning as necessary to char evenly. You can also broil them under the broiler in the oven for about 5-7 minutes turning a couple times until all the sides are charred. Place the peppers in a bowl and cover the bowl with foil or plastic wrap for 10-15 minutes. You can brown the meat for the stew while you wait. When the peppers are done, use a spoon to help scrape off the charred skin. Remove the stem, seeds, and ribs and discard. Dice the chilis into 1 inch pieces, set aside until ready to use in the stew. STEW: Heat the oil in a large dutch oven or stock pot over medium high heat. Sprinkle the beef with salt and pepper and brown in batches. Do not overcrowd the pot as the meat will steam rather than sear. Remove the browned beef to a plate. Add the onions and scrape the brown bits on the bottom of the pan with a wooden spoon. Cook the onions for 3-5 minutes or until the start to turn translucent. Add the garlic, and cook for another 30 seconds before adding in the seared beef, poblano peppers, cumin, oregano, broth, chipotle pepper, adobo sauce, and fire roasted tomatoes. 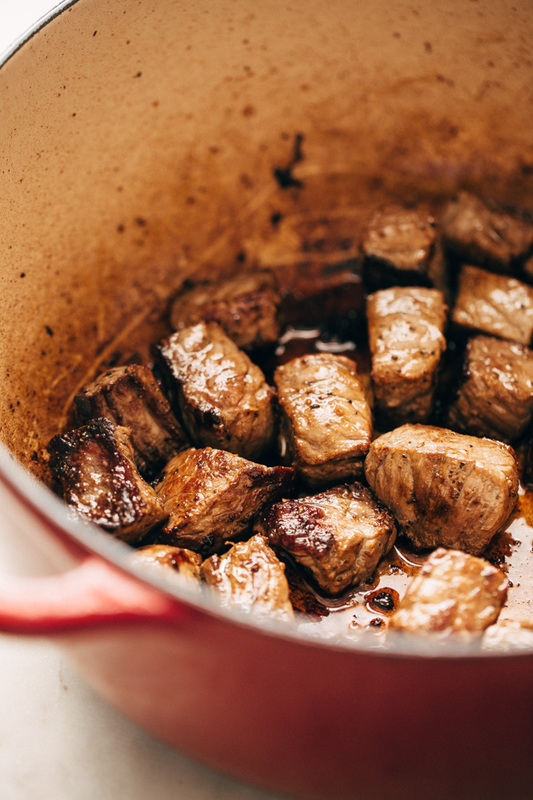 Bring the stew to a boil before covering, lowering the heat, and allowing it to simmer for 1- 1 ½hours or until the beef is tender. Add the diced potatoes at this point and allow to cook for another 10-20 minutes or until the potatoes are cooked all the way through. Top with cilantro and serve with crusty bread. You can use beef chuck roast//top round// bottom round for this recipe. Really, any kind of ‘stewing meat’ will be fine!